Plus Motif has really cute Ipad cases, Ipad mini cases, kindle fire, nook, google nexus, and black and white ereaders, and kindle paper white. These cases are so cute. I received the regular Ipad case and also a Ipad mini case. They came with three interchangeable Motif Designs. I love how these can change up how different your case can look. The first case shown below is the Ipad case which holds all versions but the ipad mini. I like how each case has a note pad and a stylus and to top it off the stylus is a pen also. Perfect for notes. Does the case allow the device to be free-standing? Yes. You can interchange the position of the device and the notepad and the case is foldable to allow it to be a stand for the iPad in several configurations. Is the case interchangeable regardless if I'm right or left-handed? Yes. The case is interchangeable. How does the case close? The case closes with a magnetic tab. Will my device slide from the top or bottom of the case? No. The device is secured by four cloth elastic bands in each corner. Is the case drop proof? No. The case does provide a padded back and hard exterior but your device could still be damaged depending how it is dropped. Will the stylus work with any other device? Yes. The stylus will work on any touch screen device. Can I order a refill of the writing pad? No. At this time, we are not providing refills of the writing pad. The next case I was able to review is the Ipad Mini Plus Motif Case. I love this case I take my Ipad Mini to church with us and use as my bible I have a app that is really great and this case comes in really handy if I wanted to write something down or make notes while in church all I have to do is take the top off the stylus and it becomes a pen so I can write down my notes. · The large case that fits the iPad case retails for $39.99 with Motif Designs for $5.99 each. 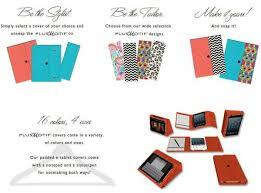 · The medium size fits the iPad mini retails for $34.99 with Motif Designs for $4.99 each. · The small size fits eReaders retails for $29.99 with the Motif Designs for $3.99 each. · There is also a journal that retails for $17.99 with the Motif Designs for $3.99 each. Would you like to win a Ipad case of your own with coordinating Motif Design?? Enter the Rafflecopter Below!! We don't have one, but we really need one. I don't even know...somebody just gave us an Ipad and I'm not sure what kind of case is on it.